Eating Local: Deep Run Roadhouse | Robert Mitchell Jr. 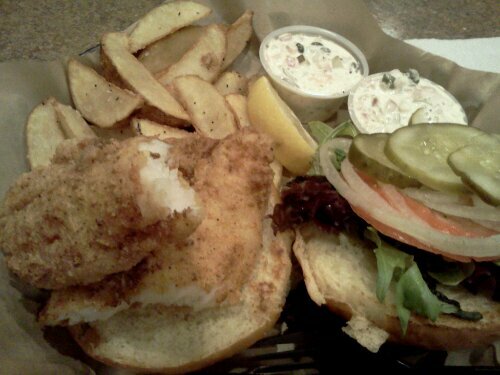 This is the catfish sandwich from Deep Run Road House. It will make you weep tears of joy and wonder. I prefer to prepare my own meals using locally sourced food and free-range meat and eggs. It’s tough to get those kinds of ingredients at an affordable restaurant, but when when I eat out, I at least like to go to private shops, non-chain restaurants, and good old-fashioned American eateries. So Saturday night I had dinner at Deep Run Road House over on Gayton Road in Richmond. I can’t speak to the sourcing of their ingredients, but I can say that I didn’t give my hard-earned cash to some faceless mega-corporation. In fact, when I went up to the condiments area and looked for some salt, the guy that handed it to me was the owner. We talked a bit and he was super. Aren’t people cool? Real people who make real stuff for other real people? I had the catfish sandwich. This super-crunchy flavorful thing is the size of small cantaloupe and comes on a fluffy, toasted bun with tomatoes, pickles, field greens, a slab of onion, and an amazing tartar sauce packed with minced onions and capers. Capers, I tell you – capers. I could sit and eat this tartar sauce with with a @*#$&%# spoon. I may be a little guy, but I eat like a Viking after a long day of pillaging and sacking. This sandwich filled me up just right, and that’s saying something. My daughter had the pulled chicken bbq sandwich (which was too big for her to finish) and a side of greens. I tasted both and they were outstanding. Note that I am a connoisseur of greens, so you can trust me when I say they’re good. Just the right amount of smoky meat, not too salty, and with just hint of sweetness and zip. My daughter said, “These are the best greens I’ve ever had.” What about my greens? I make bangin’ greens! She didn’t even bother to preface her statement with “I’m sorry Dad, but…” That stings. This is no common roadhouse (even though the NC style bbq sauce on the table is called “Swayze Sauce”). These are roadhouse dishes prepared with gourmet skill. We ate like kings for $20.00. Good service, great food, reasonable prices. What’s not to love? Next time: the 1/3 lb Bison Burger! This entry was posted in Green and tagged bbq, deep run roadhouse, dining, fish, greens, local. Bookmark the permalink.